Shutterfly has cute birth announcements and Valentine's cards. So Brittany Stucki is a photographer here in St. George and does AWESOME work! She is giving away a session so all my blogger friends that live here... actually ALL of my blogger buddies should sign up to try to win the session she is giving away! 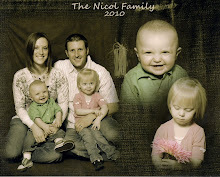 It would totally be worth the drive to get some great family pics or some pics of the kiddos! Here's a link to her blog! Wish me luck! It was late one night and I was bored and came across this contest so yes, it may not be funny to too many of you, but I find it pretty hilarious! The bag I won along with its goodies inside are valued at over $200!!! I can't even imagine owning a DIAPER BAG worth that much! So funny but I am super excited to get it. You can find the company on Facebook under The Bumble Collection and they have a link to their website from there. I've been super lazy on posting so I am sorry! We've been pretty busy here at the Nicol household. Darren is still going to school but should graduate with 2 Associates degrees the end of this semester! YAY!!! I went back to school as well and am thinking about teaching. 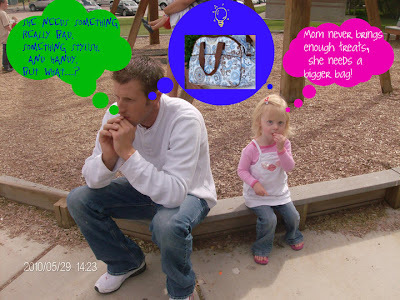 I still haven't fully decided, but lately, I want to be like mom and be a teacher. Possibly jr. high or upper elementary. I have quite a long ways to go, but I am thrilled to be going back and getting it done! And am super grateful for a husband that knows how important it is to me and is willing to be that much poorer for that much longer so I can get my education too. We are very blessed to live where we do, and even though we would love to be closer to everyone, we know we are supposed to stay here for a while. The kids are getting so big~ literally- Harley may have some heighth on Pax, but he is passing her up in every way besides! 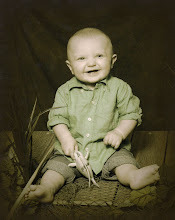 He is a big boy and has such a fun personality. I love watching them chase each other around the house and play with each other- this makes me so grateful for how close they are in age! They will always be little buds! Well I will try to get some pictures taken and post them soon! So we decided to cut off Harley's mullett! It was getting so long, but only in the back. The front is just taking it's sweet time to grow. So we figured it was time to do something about it. Mom and Harley had a girls day and both got our hair cut. She did such a good job, didn't cry and just sat on my lap and chatted her little tail off! Everyone at the salon was so impressed at how well she did and how smart she is (she likes to sing the alphabet and say her numbers). Her hair makes her look so grown up! It still is a bit too short in the front so hopefully that will start growing, but the back looks way cute! She even let me straight-iron it when we got home! The girl that cut our hair did a way good job, and I really like my hair cut as well! 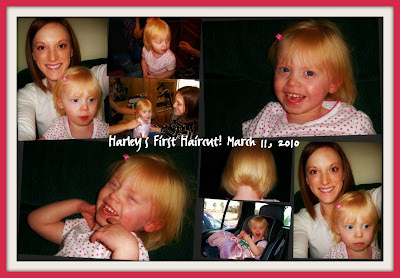 My big girl Harley Jeanne turned 2 on Friday March 5, 2010. She was so excited and would tell everyone about her "Dora Birday". I don't know who was more excited, me or her! It was really fun. I'm not sure how much she really understood about what was going on, but she loves playing with kids so I knew she would have some fun! We did a Pin the Flower on Dora game, and had a Dora Pinata, had cupcakes and juice and opened presents. She was thrilled! 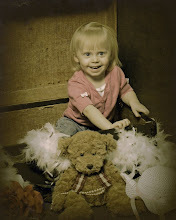 I am so lucky to have such a beautiful, enerjetic, special little girl! She makes me laugh every day and I am so grateful to have her in my life. 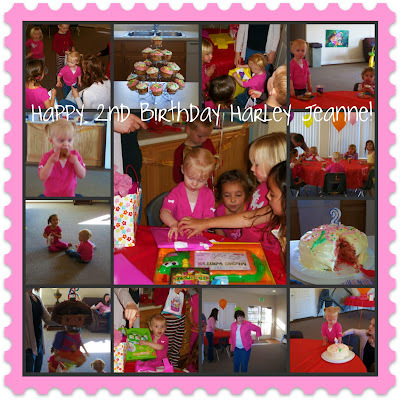 Happy Birthday Harley Jeanne! 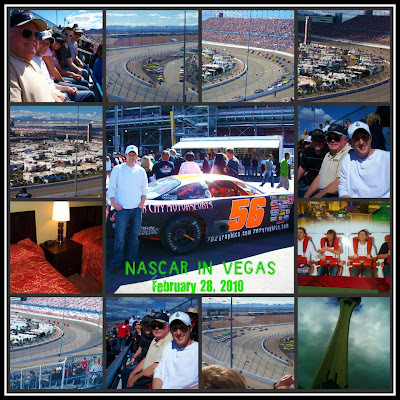 Darren had the opportunity to go to Nascar in Vegas with my dad, Chris, Olivia, Daniel and Jim. He had such a great time! I'm so glad he was able to go, he has been wanting to go for a long time! He kept telling me we were going to go (truthfully, I wasn't super excited about it but would've gone for him!) so when Daniel said we were going to get dad a ticket for Christmas I knew Darren just had to go too! Dad was thrilled and Darren was too. I'm so glad they all had such a good time! A Fisherman and his Catch!